Prime Minister, First Lord of the Treasury and Minister for the Civil Service. Studied at Eton before graduating from Oxford University with First Class degree in Politics, Philosophy and Economics. Elected Conservative MP for Witney, West Oxfordshire in 2001, became Prime Minister in May 2010 leading a Conservative/Liberal Democrat Coalition government, won overall majority in May 2015 to secure a second term as Prime Minister. The Prime Minister (PM) oversees the operation of the Civil Service and government agencies, appoints members of the government and is the principal government figure in the House of Commons. Currently engaged in trying to convince the electorate that Britain should remain part of the European Union whilst trying to convince the 27 other European Leaders that he will pull Britain out of the European Union if he doesn’t get the reforms he wants in Europe. Previously worked for the Conservative Party Research Department before being elected as a member of Parliament. Held a number of positions on the opposition front bench including Shadow Deputy Leader of the House of Commons, Front Bench spokesman for Local Government Finance and Head of Policy Co-Ordination in the run up to the 2005 General Election. Member of the influential House of Commons Select Committee 2001-2003. Appointed Shadow Secretary of State for Education and Skills after the 2005 General Election and was elected leader of the Conservative Party in December 2005. Became youngest Prime Minister in 198 years when leading coalition government in 2010. 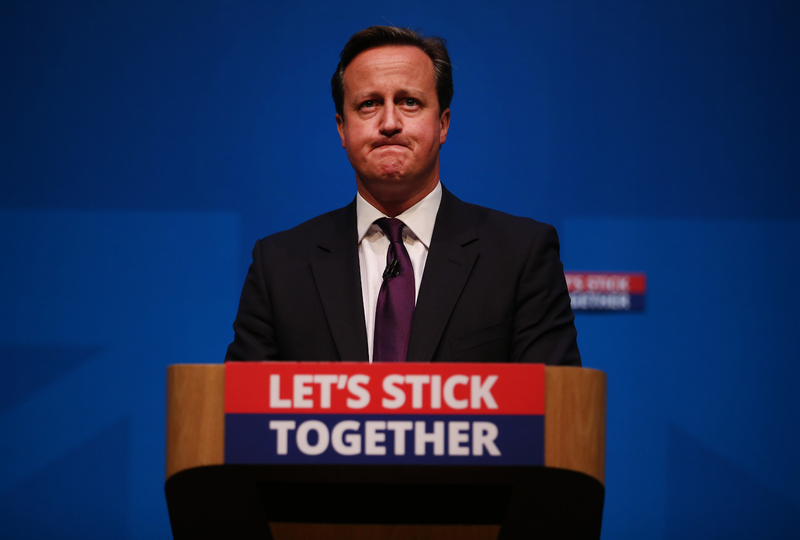 Prime Minister David Cameron addresses members of the No campaign on September 15, 2014 in Aberdeen,Scotland. The latest polls in Scotland’s independence referendum put the No campaign back in the lead, the first time they have gained ground on the Yes campaign since the start of August.